Tropinin is one of those artists whose work was influenced by the trends of such a movement as sentimentalism. This direction supposed to reflect in the works the cult of nature and sincere emotions and human feelings. The artist was inspired by nature and believed that the real muse is nature, which can teach a person to look at things with different eyes. The artist was always attracted by genuine feelings and a pure soul, therefore, more and more often children became the heroes of his paintings. It was in the children that the artist saw a source of inspiration and the creation of beauty. Tropinin saw all this beauty in children, depicting them with birds, various toys and musical instruments. And one of these warm and soulful pictures is the “Girl with a Doll”, transmitting to the viewer a cozy atmosphere and a child in whose hands is a toy. The artist intentionally uses this technique and distracts the viewer’s attention from the character of the child, creating a generalized image of children. 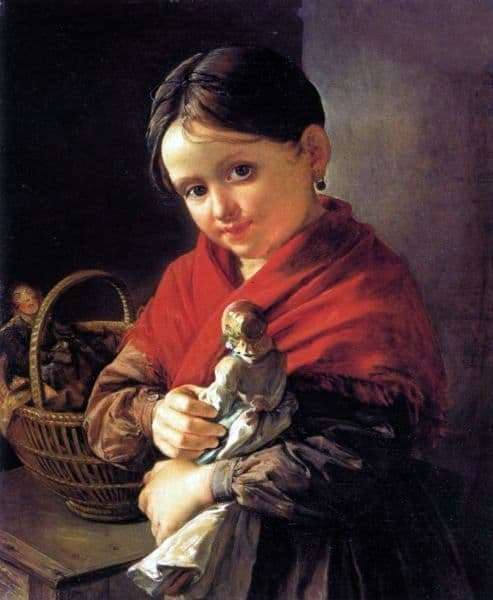 The famous Russian artist Tropinin portrayed a child who enjoys the moment and the joy of playing with a doll. Looking at this picture, a smile appears on the face of how warm, lively and radiant this piece is. The viewer can enjoy the beautiful and sweet scene, during which the character of the child manifests itself. In the picture, the artist showed a beautiful little girl, in whose hands a doll, and in the background are seen the rest of the toys of the beautiful baby. Warmth and home furnishings – this is the goal that the artist sought and very successfully.